Timing is everything as they say, and with Bluetooth, it’s always an important focus. Multitudes of timing parameters defined by the Bluetooth specification are system-critical. It is understandably important to characterize these timings efficiently and accurately. Hardware and software timing issues are often the source of many interoperability and performance issues that challenge Bluetooth engineers. The Instant Timing view displays a multitude of information along a common timestamp, including Bluetooth and Wi-Fi packets, HCI traffic (UART, SPI, and USB), generic communications (SWD, I2C, UART, and SPI), and logic signals. A variety of data throughput and packet transmission statistics are included to complete the approach. Several timing features, both manual and automated, are provided. 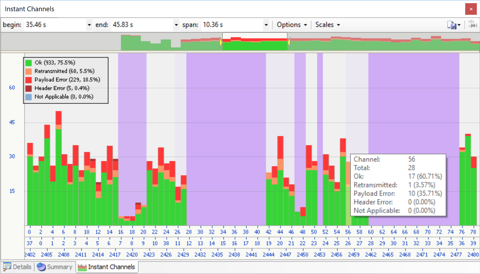 Understanding device data throughout performance is a common task for wireless engineers. These metrics are the domain of the Instant Throughput view, which provides throughput by device and by L2CAP or SCO/eSCO channel and Wi-Fi communications. A convenient statistical overlay provides information on how various transmission inefficiencies may be affecting throughput, such as packet retransmissions. 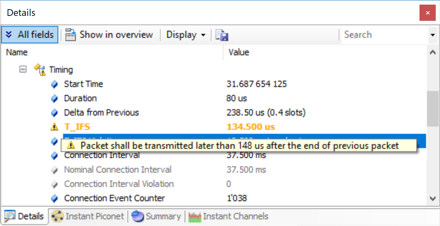 The Instant Channels feature provides easy-to-understand visual and statistical analyses on various per-channel transmission characteristics, including packet retransmissions, header errors, and payload errors. This information can be useful in understanding where in the Bluetooth spectrum devices are communicating and the spectral areas (channels) they are avoiding, generally due to external interferences. This information is provided for the duration of an entire capture and can be configured to characterize all devices in the vicinity or specific devices. Bluetooth technology has become very popular among consumers and continues to evolve into new applications and markets, leading to more complex use cases. The only way to support these new use cases is to create more complex topologies, for example, Mesh Networking. Debugging complex topologies has always been a difficult task, but Bluetooth Vanguard is up to the task with its powerful wideband radio capable of capturing any traffic from any device, including the most complex topologies. The Instant Piconet view helps developers visualize their topol ogies live while capturing, and also provides a play-back feature showing step-by-step evolution of topology changes. Wireless traffic is the primary element of debug information for Bluetooth engineers, but Host Controller Interface (HCI) traffic can be an equally important complement of information for getting a clear and complete picture of a given situation. Bluetooth Vanguard supports capture of HCI transports over USB, UART, and SPI. HCI traffic is captured concurrently with the wireless traffic and other wired streams using the same precision clock for perfect synchronization and timing analysis and is decoded and displayed in various formats. HCI capture is also a very convenient feature when working with devices that implement newer-generation security features, such as Secure Simple Pairing (SSP) or Secure Connections (SC). The Ellisys analysis software automatically extracts any Link Key exchanged over HCI and uses it to decrypt the wireless traffic, all without any user interaction. 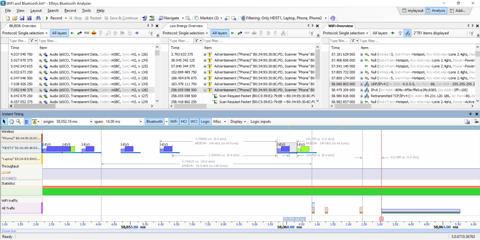 Another common debug application involves comparison of audio streams, both over-the-air, and over HCI. These streams can be played live, exported to WAV, looped, and otherwise closely examined for differences in quality and performance, helping the Bluetooth engineer to root cause issues to stack or coexistence issues. The Instant Spectrum feature provided by Vanguard displays raw RF spectrum information in the busy and unlicensed 2.4GHz ISM band in which Bluetooth operates. This feature is yet another Ellisys innovation. Other users of this band include Wi-Fi, LTE, ZigBee, ANT, microwave ovens, and a broad range of other proprietary and commercial technologies. These users can and do interfere with each other, and it is often necessary to have a better understanding of the wireless environment. The capture of raw RF spectrum is the perfect tool for characterizing and debugging coexistence issues, RF attributes, and low-level RF operations. Signal strength of all emitters (RSSI) is displayed using absolute values on flyovers and using color-gradients. A configurable resolution of up to 1 microsecond is available. This raw RF information is displayed in synchronization with captured Bluetooth and Wi-Fi packets. Channel avoidance schemas (Adaptive Frequency Hopping behaviors) are overlaid, enabling a keen understanding of the complexities of the instantaneous RF challenges encountered by any given Bluetooth link. 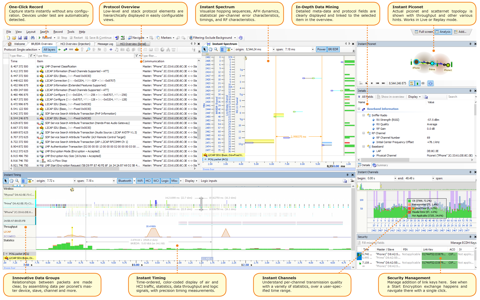 Packet errors, retransmissions, and header errors are each characterized visually and statistically, along with adaptive frequency hopping (AFH) employed by any given link. Various approaches are provided to allow timing measurements. The logic analysis feature allows for capture of external logic signals, in synchronization with the wireless, HCI, and all other traffic steams. Any digital signal is supported, including general-purpose I/Os (GPIOs) or dedicated pins such as TX/RX Active. One of the many applications for this feature is keeping track of a device’s power consumption in various states, by using dedicated hardware such as comparators for determining whether key thresholds are exceeded. These signals are visualized with 5-nanosecond precision and compared with the other captured streams in the powerful Instant Timing view of the Ellisys software. 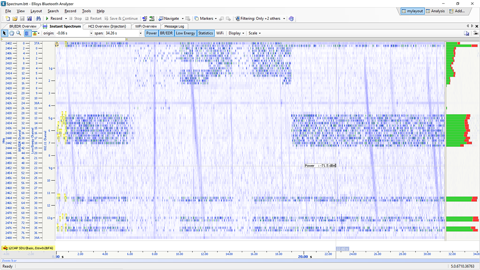 The Ellisys analysis software includes integrated Audio analysis. Any captured audio stream can be quickly and easily played back, even live, during capture. A convenient export to WAV is available. Associating imperfections in the audio stream are easily correlated to root-cause sources, such as retransmission issues, interferences, topology changes, or stack issues. Audio captured over HCI or from an Audio I2S input [PRO] can be played back as well, in perfect synchronization with over-the-air audio streams. This enables characterization of the complete audio chain, from the uncompressed audio provided to the source radio chip, to the audio transmitted wirelessly, and the decoded audio received by the receiver radio chip. 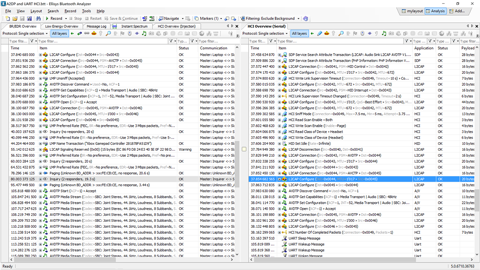 The analyzer software alerts the user to a variety of errors detected for both wired and wireless captures. Physical, protocol, and profile layer errors, including packet and transactional errors, are automatically highlighted without any need to search through the capture. Errors are highlighted on a color-coded system to indicate the relative severity of the errors, summarized in a dedicated status column in each protocol overview, and described in the Details view or with pop-up messages on fly-over in the Overviews. Incomplete payloads, missing or incorrect field values, center frequency violations, timing violations, missing responses, and CRC errors are among the errors indicated. There are various user applications that require the use of the analyzer in an automated fashion, often under control of user-defined software applications performing a variety of tasks. These applications may include long-term test environments, integration of the analyzer into a mobile platform, and other usage models. 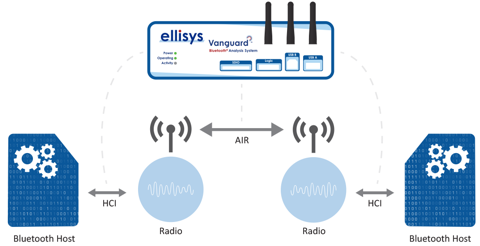 Thanks to the ease-of-use and robustness provided by the Ellisys Digital Radio, the Bluetooth Vanguard is ideal for these tasks. The analyzer can be controlled with a simple yet powerful Remote Control API (Application Programming Interface) to programmatically start / stop / save captures and extract specific captured information that can be used for various purposes, including go/no-go testing, all without any manual operation. A unique segmentation feature works seamlessly with the API to allow for extremely long captures, segmenting captures into smaller more manageable slices while maintaining topology and contextual information from capture to capture.